A new quest appears every day with items that are useful for Class Up, and items to help clear the Main Quest such as Weapons and Armor. The rewards for each quest differ. ▼ Quests Cost 1 Bread! During this period, Main Quests will all cost  Bread. Use this time to clear the Main Quests and collect recipes and items you need. ▼ Each Facilities' construction time greatly decreased! During this period, the time, gold, and resources required to level up a facility will be greatly decreased. This 1 bread cost, technically you can play Kanpani 24 hours non-stop, picking up missing recipes, farming rare materials and leveling up your girls. 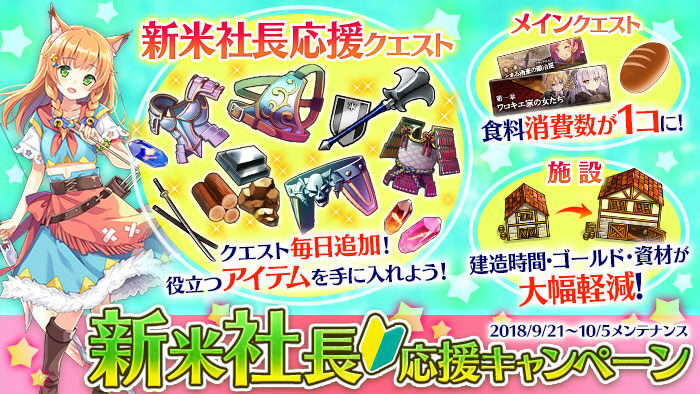 For one thing, thats a good opportunity to use excess bottleslimes and pendants to stock up gold tickets, since even the latest story chapter costs 1 bread.